A place for every tool and every tool in its place, we have five up for grabs. The new C.K Magma Pro Tool Case Plus (MA2640) is the ultimate bag to organise and protect tradesmen’s tools. Regularly working with tradesmen gives C.K Magma valuable insight into what works best. As a result, this great new product provides the latest vertical tool storage facility, which not only offers perfect organisation within the tool bag, with a place for every tool, but also helps prevent any tools being lost, which can be extremely costly. The storage case offers a range of fantastic features and benefits, designed to make every tradesman’s job that much easier. It boasts over 60 vertical storage pockets and holders, offering easy access and the best organisation of valuable tools. The outer construction of the Pro Tool Case Plus offers superb strength and durability and includes heavy duty pierce protected zips, with a 100% water and crack-proof base, all designed to keep tools safe and secure in transit, as well as deliver long lasting performance. The tool case also has a choice of short carry handles and shoulder straps for easy portability from one task to another. Another top feature is the impressive dual side, wide opening storage which houses the generous vertical tool storage facility, to enable easy visibility and quick identification of the right tools to do the job. Measuring 450 x 290 x 340mm and weighing in at just 2.65 kg, this quality tool case has all it takes to be a hit with busy tradesmen who need easy to handle, reliable storage for their tool kit. 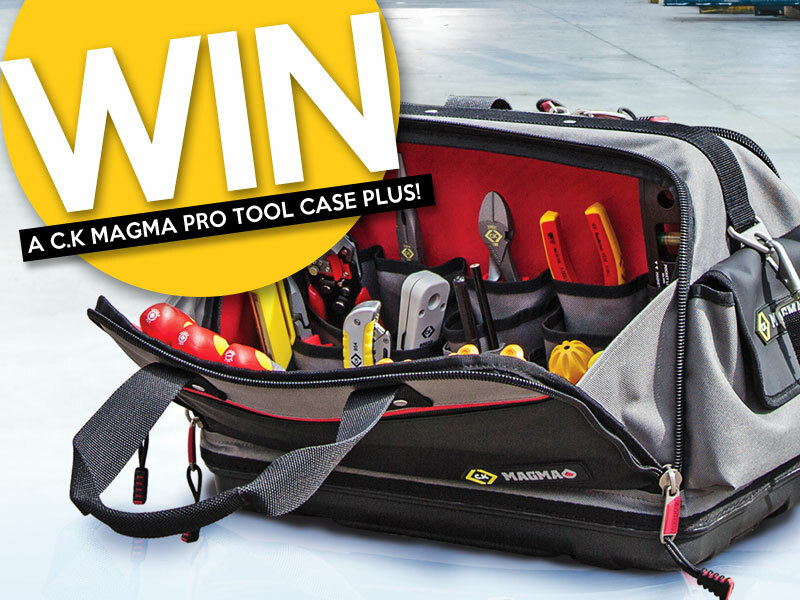 To be in with a chance of winning a C.K Magma Pro Tool Case Plus simply enter using the form below! I would like to opt in to receive emails from Professional Electrician and carefully selected third parties. Deadline for entries is 10/05/2019. Usual T&Cs apply.